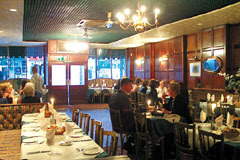 This long established vibrant restaurant is very definitely the place for a fun night out and an ideal venue for parties and functions – popular for hen nights - where you can enjoy traditional Greek cuisine and friendly service. On Friday and Saturday nights there is Greek dancing and plate smashing followed by a disco until 1am with plenty of room on the dance floor (booking essential). Whilst the restaurant does not open until 6pm and not on Sundays, parties are welcome outside these hours. Open Mon-Thu 6-midnight, Fri-Sat 6pm-1am. All major credit cards accepted (not Amex/Diners). 10% service charge. Greek cuisine has four secrets: the good fresh ingredients, the judicious use of herbs and spices, the famous Greek olive oil and the vegetables and herbs. Lamb and goat is favoured over beef and famous dishes include mousaka, souvlaki and horiatiki salata.